The Food Basket, Hawaii Island’s food bank, announced the appointment of Kristin Frost Albrecht as interim executive director, succeeding Executive Director En Young, who recently resigned. Young will continue his efforts in food sustainability as the general manager of a technology-based startup, applying modern techniques to greenhouse farming to increase productivity and provide nutritious food to more people in Hawaii. Since taking the helm in 2013, Young led the continued development and success of the Food Basket. Part of his legacy includes the completion of the new Kona warehouse, which allows the Food Basket to better serve West Hawaii. Young also led the successful implementation of a SNAP-based CSA program that was focused on food sustainability and a new food insecurity nutrition incentive program. Albrecht has served the Food Basket for nearly three years as director of public relations and events and director of grants and compliance. Before working at the Food Basket, Albrecht was the managing faculty in the Family and Community Health Department at Oregon State University’s Cooperative Extension Service and served as executive director of the North Coast Food Web. 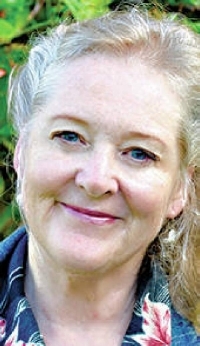 She also has served on the board of directors of several other nonprofits in Oregon.